Yay! I'm thrilled to report that I finished all the Camp Create challenges! From deciding I didn't have time to fit them in this time, to making the call to give it a go two days ago, I managed to make 6 cards and blog them! This last card is for the Awesome Ombre challenge. I just love the yellow to orange ombre look and used five Distress Inks to create this panel. I then die-cut the panel with the Vertical Stitched Strip die and adhered it to my white top-folding card base. 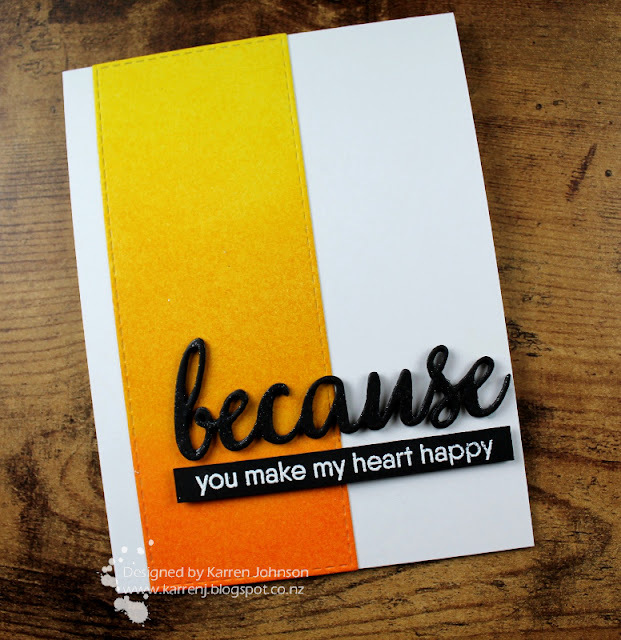 The 'because' was die-cut four times and stacked and the top layer was given a coating of clear sparkle pen. The rest of the sentiment was white-embossed onto black. Edited to Add: Thrilled that my name was randomly chosen for the Grand Prize of a $US150.00 MFT voucher! You are a card making machine! I am a total fan of your ink blending! Congratulations mf and what an amazing job you did. A fantastic collection of cards. Your blending looks so smooth and perfect! Gorgeous card! Congrats on your Grand Prize win at MFT! Your Camp Create cards are all so wonderful, Karren! Well done! CONGRATS on being the winner of the Grand Prize at MFT!!! You are so deserving, Karren...you always, always, always make their products look amazing and I know you're going to have a blast on your shopping spree...way to go, my friend!!! 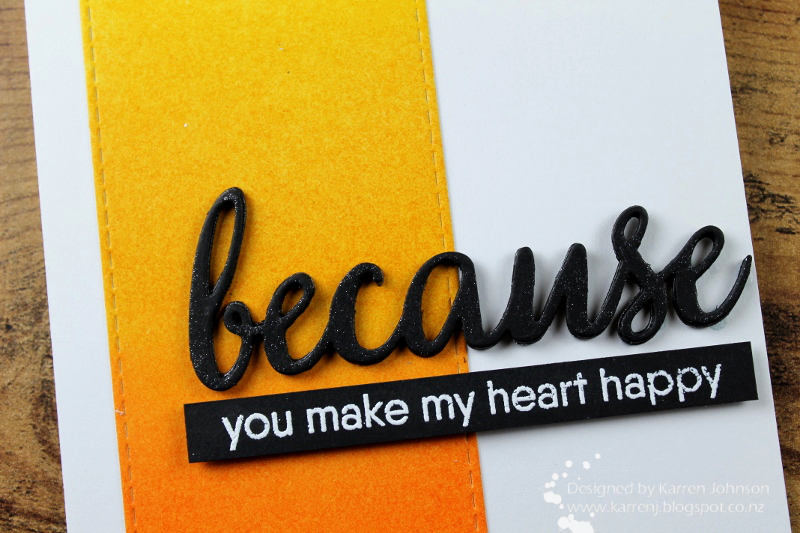 You've done such a beautiful job creating the ombre effect with your inks and I love how it contrasts with the bold black die cut sentiment and banner...Another fabulous card!! !